Not everything that happens online, stays online. Your digital marketing efforts can be responsible for a lot of the traffic you receive on offline channels as well, such as the telephone. Keymetric allows you to track all your online and offline channels simultaneously, in order to better understand where your phone traffic is originating from. With a Keymetric dashboard, show your Keymetric data, as well as the rest of your traffic data, in a neat and concise dashboard. Create your Keymetric dashboard today! 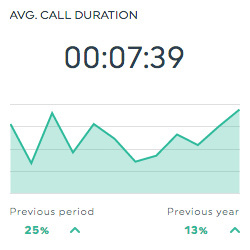 This historic widget shows the average duration of each call received. It is calculated by dividing the total call duration by the number of calls. This list widget shows your calls by source, in order of total number of calls received. 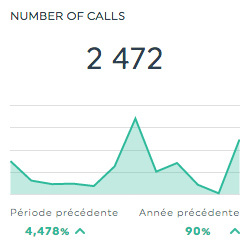 This list widget shows your calls by status, in order of total number of calls received. This historic widget shows your total number of calls. Want to see all our Keymetric preset widgets? This shows the average duration of each call. It is calculated by dividing the total call duration by the total number of calls. This shows the total number of calls received. This dimension allows you to isolate your data based on ad group. This dimension allows you to isolate your data based on call status. This dimension allows you to isolate your data based on campaign. This dimension allows you to isolate your data based on sales disposition. This dimension allows you to isolate your data based on source. Want to see all our Keymetric metrics, segments & dimensions? How do I create reports and dashboards using the Keymetric Call Tracking API?